The first project per system uses a hand-built case you can make with templates, X-Acto knives, plastic and thin aluminum. 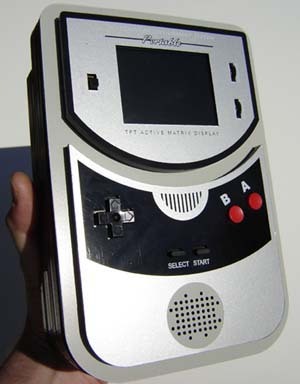 The hand-built NES from the front. 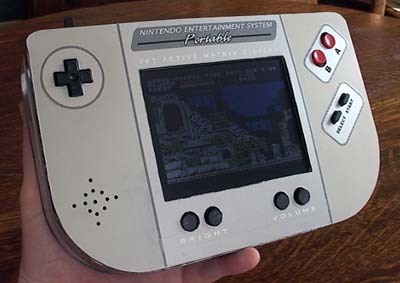 It uses a hacked 5″ PSone screen for the display and contains an entire original model NES motherboard. The rear of the unit. 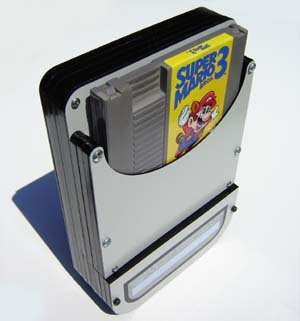 The cartridge slides down the back and the battery door can be seen to the left. To the right is the Player 2 controller port. 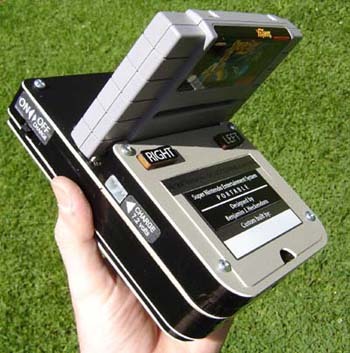 The unit’s total size measures 9.25″ x 5.75″ x 1.75″ and weighs a little over 1 lb with battery and game cartridge. This portable project uses case parts cut by a CNC machine. This allows for accurate alignment of screen holes and more complex features such as the speaker holes near the bottom and the curves in the raised portions such as the screen riser and controls. Most of an original NES motherboard is inside, with the cartridge slot rewired 90 degrees. The screen is a 3″ TFT active matrix display from a pocket television. Here’s the rear of the portable. 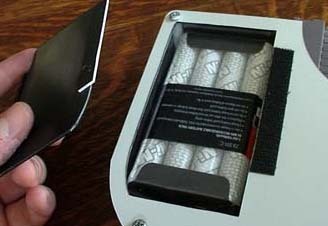 The cartridge slides down the back and sits flush with the top of the case. 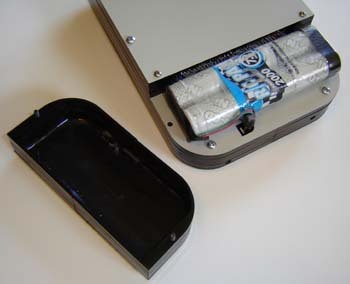 This portable uses a large Ni-MH battery pack for extended life. As with the hand-built NES batteries these are fairly common and can be charged using cheap wall adapters from you local Radio Shack. 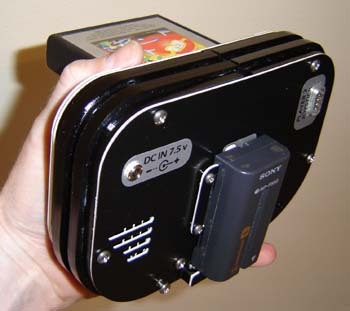 The unit’s total size measures 8.5″ x 5.75″ x 2″ and weighs about 1.5 lbs with battery and game cartridge. 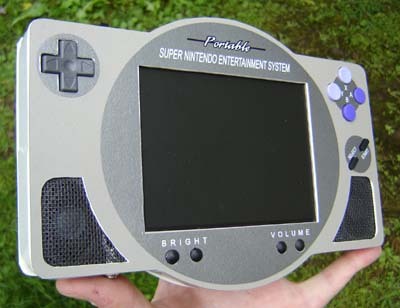 This portable uses the new smaller version of the SNES (often called the “mini SNES”) and has a 5″ PSone screen for the display. On the back the cartridge inserts at a 90 degree angle (which keeps you from having to rewire the tricky cartridge slot of the SNES) The left and right shoulder buttons can be seen, and the 6 AA Ni-MH rechargeable batteries insert under the black half-circles on either side of the cartridge. (You know, for balance!) Note the charge jack in the lower right – the batteries can be charged without taking them out of the unit. 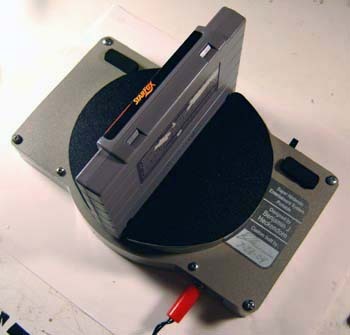 …which makes it a little trickier to build than the hand-made NES but it’s worth it. Thin is cool! 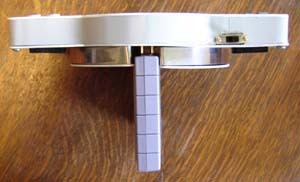 As with the other SNES the cartridge sticks out the back. In this photo you can see the charge jack (uses the standard RC car plug), the battery door and the shoulder buttons. 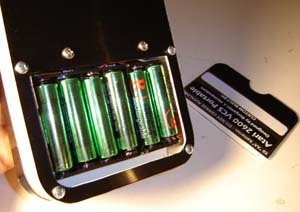 Here’s a view of the 6 AA Ni-MH rechargeable batteries that power this portable. 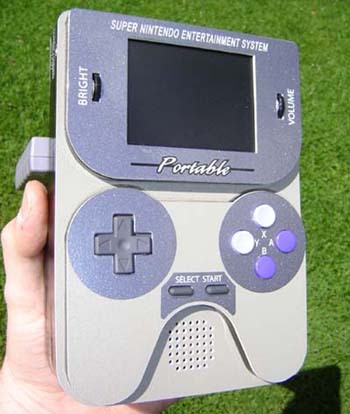 As with the other SNES portable they can be charged within the game system itself. 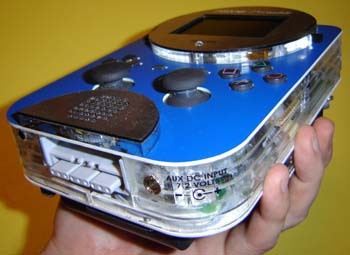 Here’s the hand-built PSone portable from the book. 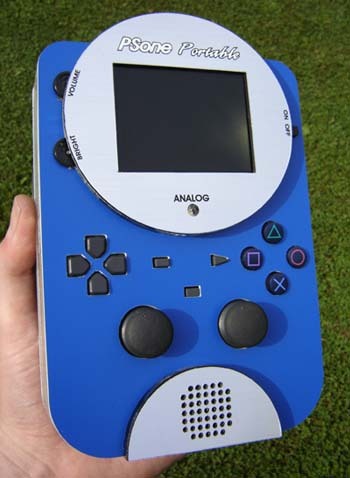 It has a 5″ PSone screen (finally the screen ends up where it belongs 🙂 and measures 8.625″ x 6″ x 2″ It has both analog control sticks, though the right-side one is custom made to save space. 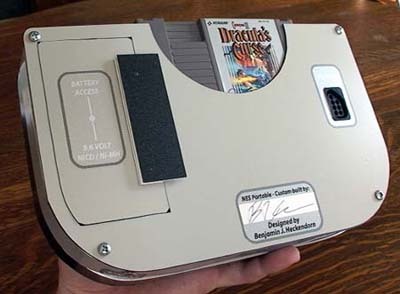 There’s a small button which allows the lid to open revealing the game beneath. Stereo speakers flank the screen/lid and a disconnect switch keeps the unit from running with the lid open. The rear of the unit. You can see the memory card/Player 2 and the left and right shoulder buttons. 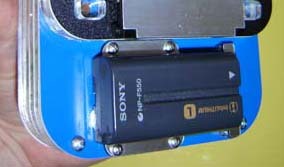 This portable uses a Sony Infolithium Type “L” rechargeable battery – the kind in Sony Mavica still cameras and their line of digital camcorders. 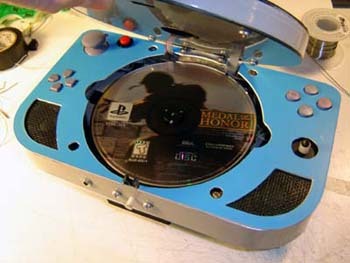 Front of the CNC-built PSone portable. It has both analog sticks mounted on their original circuit board for simplicity, while the D-pad and triggers have new boards underneath. 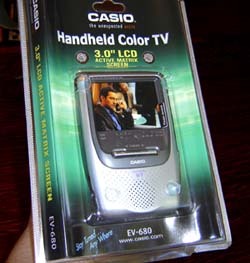 The display is a 3″ TFT active matric pocket TV. Here’s a angled view of the unit. Note how clear acrylic has been used – you can see right inside the thing! (Hopefully the soldering job looks OK 🙂 The Player 2/Memory card port is also visible. 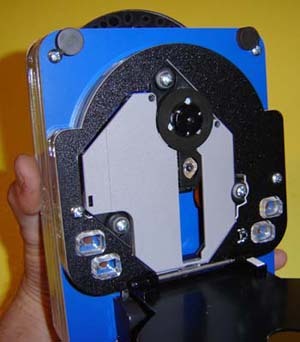 This unit also uses a Sony Infolithium Type “L” battery, which clips on the back below the CD drive. 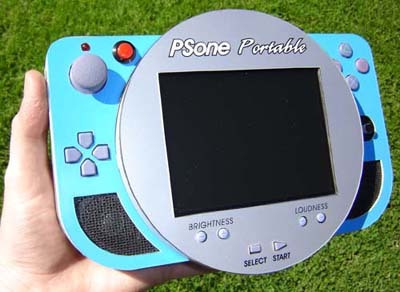 This PSone portable measures 5″ x 7.75″ x 2″ and weighs about a pound. 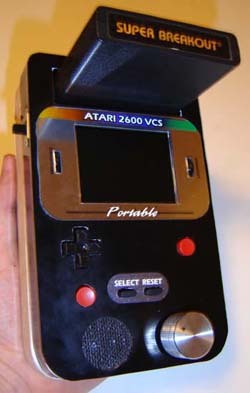 A fairly simple portable, it measures 7.25″ x 4.5″ x 1.5″ and includes the paddle controller (silver knob on lower right) whereas the joystick had been replaced with a plastic joypad/trigger from a NES controller. The screen is a 3″ TFT active matrix display from a pocket TV. 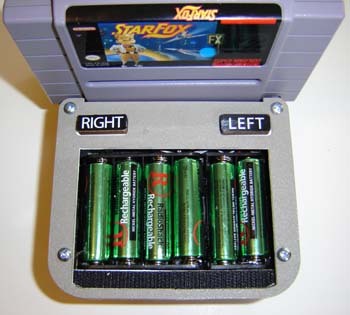 As with the SNES’s this portable runs off 6 AA Ni-MH batteries. 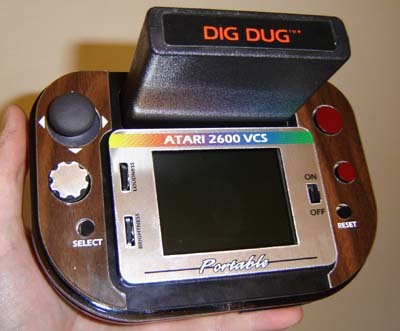 This is a nice little compact Atari 2600 portable with a 3″ TFT active matrix display. Note how it uses a Playstation analog stick for the controller! The silver serrated thing below it is the paddle knob – this thing is quite custom! It measures 6.5″ x 4.5″ x 2″. 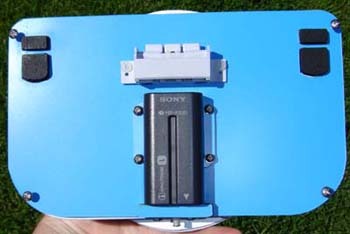 Speaking of Sony here’s the battery pack on this unit – a Sony Infolithoum Type L that it clips on the back. You can also see the auxiliary power input jack and the player 2 joystick port. 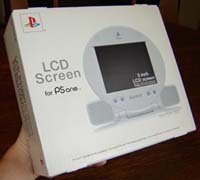 The 5″ PSone screen. This model was released back in 2000 and is still pretty easy (and cheap) to find today.